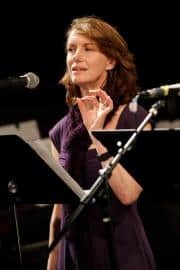 (GOLDENDALE, Wash., March 30, 2015) – Maryhill Museum of Art invites the public to celebrate National Poetry Month (April) with several programs and Washington State Poet Laureate Elizabeth Austen. On Thursday, April 23, 2015 from 2 to 4 p.m. Elizabeth Austen will lead a Poetry for All workshop at Maryhill, featuring close readings of contemporary poems and a chance to write the first draft of a poem. No experience is necessary and all are welcome. Pre-registration is required for this free workshop. To register, call 509-773-3733 ext. 25. Elizabeth Austen performing with the Sandbox Radio Collective. Ms. Austen will also facilitate an evening workshop on Thursday, April 23 from 7 to 8:30 p.m. at the Goldendale library. The Poetry Aloud workshop will explore the art of poetry on and off the page. Finally, on Thursday, April 30, 2015 Maryhill Museum of Art will participate in national Poem in Your Pocket Day. Visitors who arrive at the museum with a “poem in their pocket” will receive free admission and are invited to take part in an informal afternoon reading. Participants will also enjoy a free coffee, tea, lemonade or ice tea in the museum’s café. As Washington State Poet Laureate, Elizabeth Austen is charged with building awareness and appreciation of poetry. To that end, Austen is visiting all 39 counties, celebrating Washington poets and poetry. Join Austen for a hands-on poetry workshop designed to engage participants’ imaginations, life histories and sense of empathy through language. The class includes close reading of a few contemporary poems, then using one as a model for writing a first draft. Participants are encouraged to bring a photo of a loved one. No writing experience needed, and all are welcome. The poet laureate program is sponsored by Humanities Washington and the Washington State Arts Commission. Limited to 20 participants. Cost: FREE; reservations required. To register call 509-773-3733 ext. 25. Every poem has two lives: its life on the page and its life aloud. 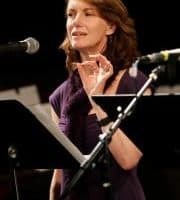 In this workshop with Washington State Poet Laureate Elizabeth Austen, you will learn and practice the art and pleasure of bringing poetry to life over the airwaves. Participants can bring one or two short poems (either their own or a favorite poem by another writer) and do not need to have any previous experience with poetry. The KVGD-LP sound equipment will be set up and workshop participants will recite poetry and have their efforts played back and critiqued. The program will be podcast and made available on the KVGD-LP website. The poet laureate program is sponsored by Humanities Washington and the Washington State Arts Commission. Cost: FREE; minimum of 5, maximum of 20 participants. Call 509-773-4487 for info. Thursday, April 30 2015, 1 to 3 p.m.
Writer’s Bloc and Maryhill present Poem in Your Pocket Day at the museum. Pull a poem out of your pocket and show it to staff at the entrance desk and receive free admission. All participants are invited to read or recite their own poem or a favorite. Winners of the Poetry Writing Contest sponsored by Writer’s Bloc and KVGD-LP Radio will be presented with winners’ certificates. The program will be podcast and made available on the KVGD-LP website. Cost: FREE museum admission with a poem; show the poem in LoÏe’s and receive a free coffee, tea, lemonade or ice tea.